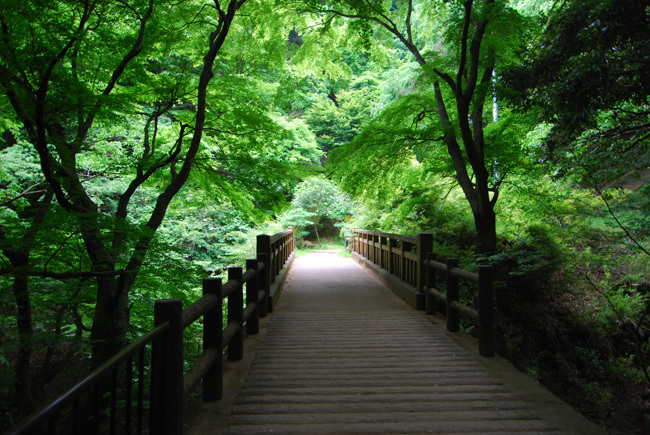 The peace and satisfaction of hiking in Japan's countryside contrasts sharply with the toil and hassle one has to go through to get in and out of the urban sprawl, in my case Tokyo. 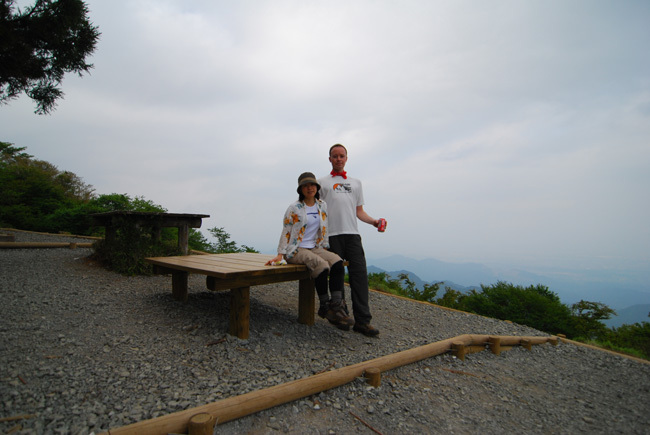 This time around, Kumi and I headed to Mt. Oyama in the Tanzawa area. It was purely a last minute decision though. 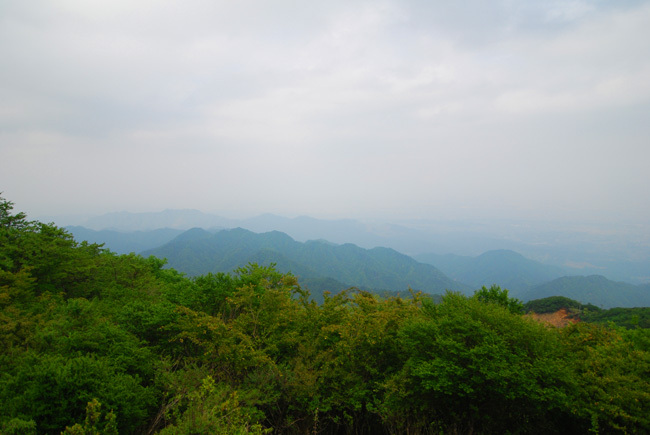 We had planned originally to go to another hike in Okutama, that required a good 3 hour train ride one way, but we woke up too late (7:00 am is too late for most day hikes in the Tokyo area), so we had to fall back on Mt. 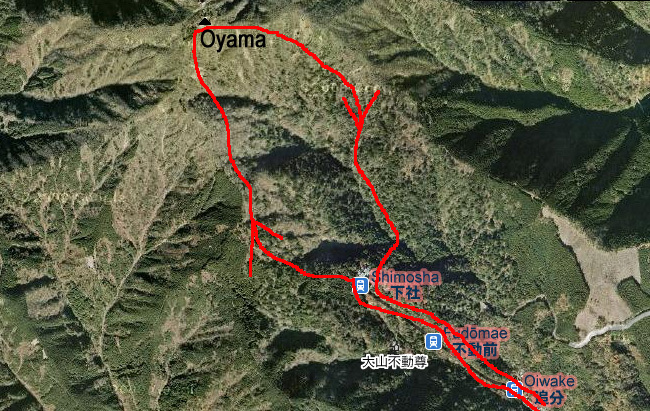 Oyama (one of the closer, shorter Tokyo area hikes) to have any hope of finishing the hiking circuit and getting back home at a reasonable time. We reached Isehara station on the Odakyu line and then after another 15 minute bus ride (which was severely crowded), we arrived at the starting point. After a 10 minute walk up some stairs and past a bunch of Tofu restaurants, you have the choice of taking a cable car (which ends about halfway up at a temple) or going it on foot. Predictably most people opted to be pulled up the mountain, but Kumi and I came here to hike, not wimp out in the cable car. After this pleasant and flat little bridge, the hike to the end of the cable car line became surprisingly steep and difficult, however it was well maintained with stone steps almost the whole way. Maybe it's just me, but hiking up stairs is more difficult than rough, uneven ground. Maybe because we deal with stairs every day that walking up them seems like the common drudgery of daily life? I find I have much more energy when the hiking path is just a rough trail. The path following the cable car, although quiet, wasn't really very photogenic. 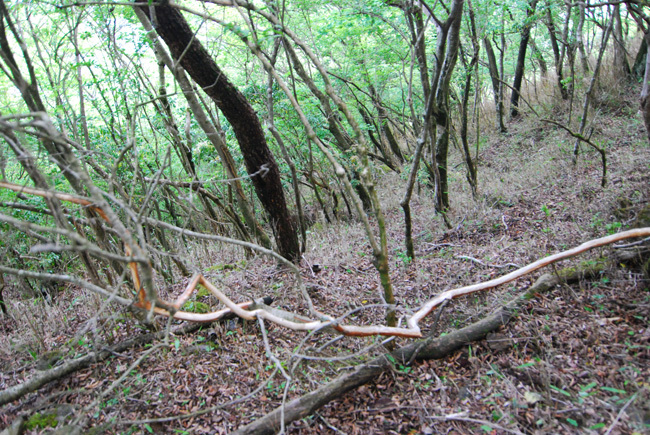 There were fences, power lines, and construction poorly concealed by the surrounding nature. 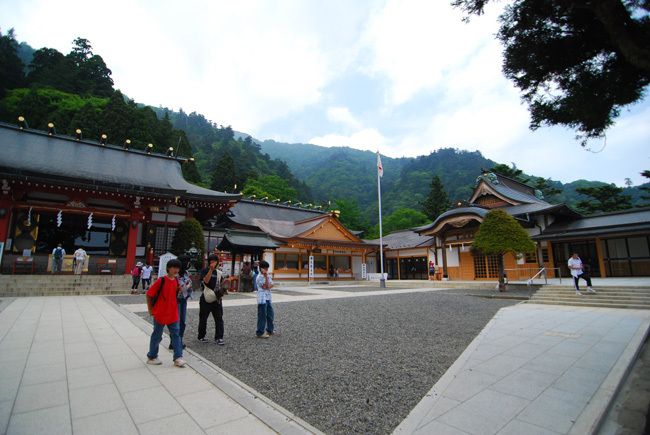 Once we reached the last cable car stop, nature was replaced by what looked to be a brand new temple complex. I was expecting some old, quiet structure overgrown with vines and such, but this place looked like it was built yesterday. The flat, clean, almost plastic looking buildings had no soul or character to speak of. Off to the left was a little fenced enclosure with some sad looking deer waiting hopefully for handouts. To the right was a bunch of shops and restaurants with the propetiers shouting aggresively at all who passed by to come in and rest, eat, spend money, etc. We left quickly. I felt that from this point onward was the beginning of the true hike. Construction, stone steps and wires (but not fences) finally disappeared, and we were left alone (for a short time) to hike in peace. Kumi pauses for a break during our ascent. I'm not sure what happened, but suddenly, about halfway up, tons of people appeared. At a small rest stop we were sitting on a bench when a group of about 20 hikers came down the trail. They immediately converged on our bench, started smoking, shouting to each other, and generally doing their best to ruin the peace and quiet of the surroundings. I couldn't take it for more than a couple minutes and we left. We continued up, but the narrow path was now being bombarded with huge groups of people descending. Sometimes we waited off to the side of the path for 5 minutes or so before a break in the crowds allowed us to continue up. 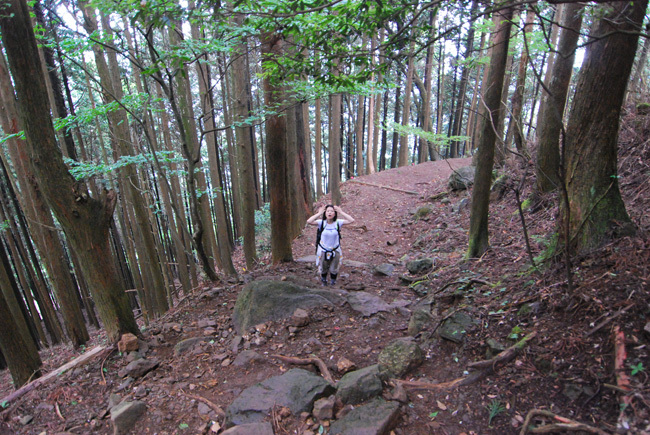 It was less like a hike, and more like walking down the sidewalk in Shinjuku. Another small lookout. The sky was becoming increasingly hazy and grey, but the rain did hold off for the whole time we were hiking, which was nice. 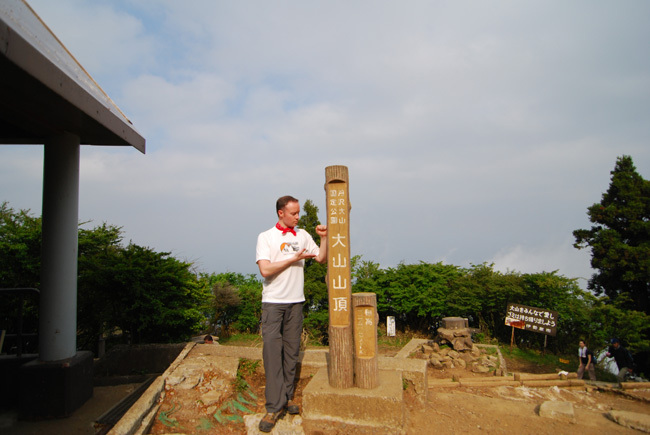 We reached the top to find a collection of rickety old shacks (one of them a snack shop selling beer, ice cream and softdrinks), and a bunch of people milling around. Climbing mountains makes me crave Coke, and Kumi and I couldn't resist getting one even though it was 250 yen for a can. Strangely enough, everyone was on one side of the mountain, and didn't seem to know that there was another, nicer rest section on the other side. Kumi and I discovered it and sat around for a while in complete peace and silence while everyone else crowded unaware on the other side. Sweet. 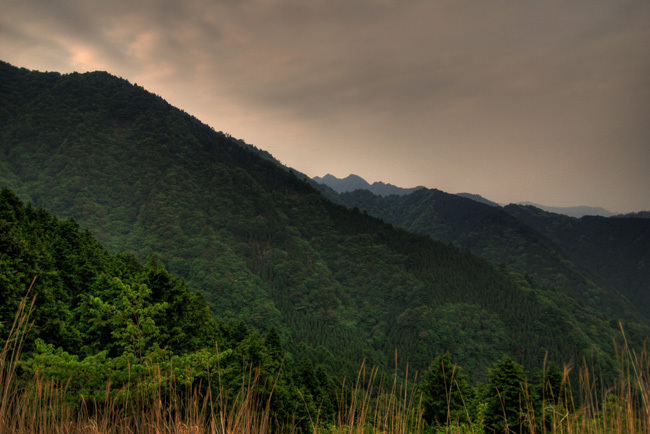 The pinnicle of Mt. Oyama, hooray. The hike down was everything the hike up wasn't. Checking the map, there were two ways to get down. One way is considerably faster (the way we came up) and I suppose that was the reason why everyone chose it to go back down again. Kumi and I took the longer way, and were rewarded by peace, silence, undisturbed nature and almost no people. We even saw a wild deer, but it moved away before I could get my telephoto lens out, so I had to settle for a picture with my wide angle lens. Can you spot the deer? Hint, look carefully just down and to the left of the center of the picture. It's extremely hard to see, so if you can find it, pat yourself on the back. More fun than Where's Waldo! About halfway down we reached a large rest/view area which is incidently where I took the HDR picture on the top of this post. 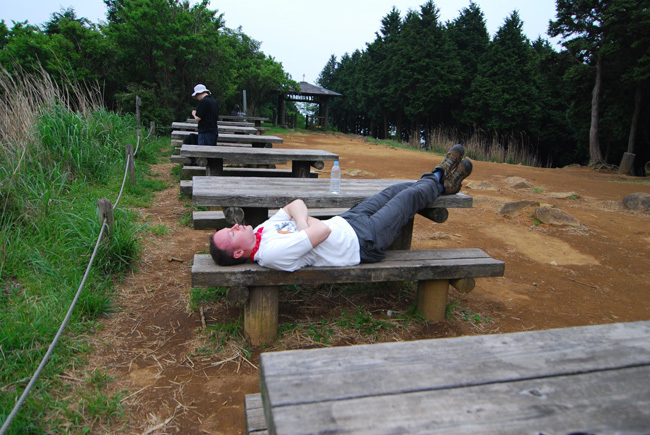 Kumi snapped a picture while I took a quick break with my feet elevated. 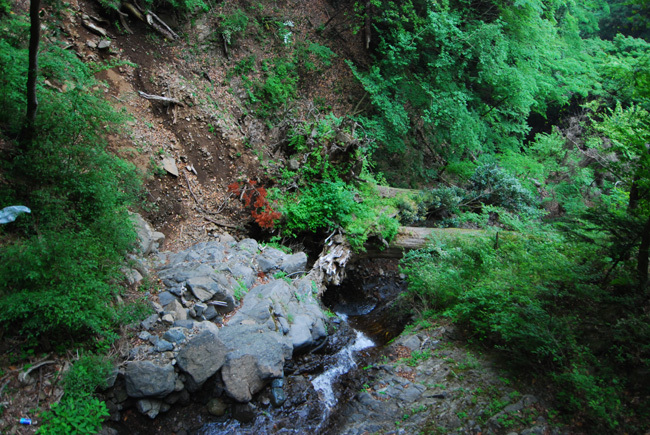 The hike followed a mountain stream for a while which was an added bonus. We got back to the bus station to find the bus conveniently waiting for us and headed back to Isehara where we indulged in yakiniku and some cold beers before heading back into the madness of Tokyo. Not a bad day!